We are all so concerned about the kinds of foods we put into our body…why should it be any different for your dog? The kinds of ingredients that are in the pet food you give your dog are very important and some dog foods are definitely healthier than others. 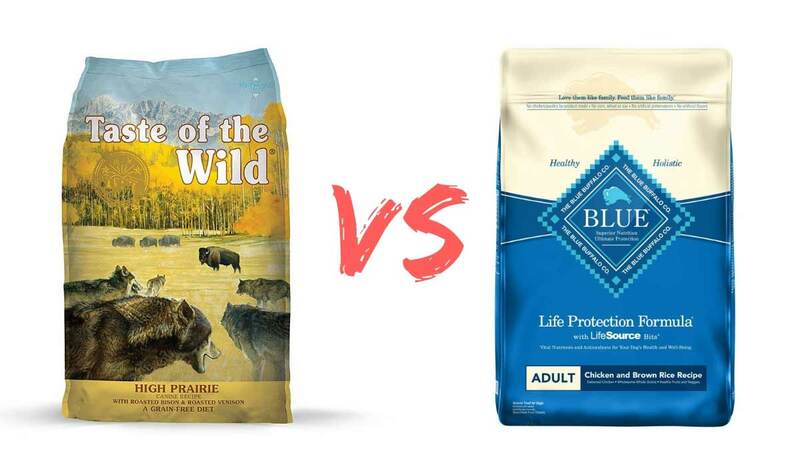 This article will explore and compare two of the healthiest and most nutritious dog foods on the market: Taste of the Wild vs. Blue Buffalo. The AAFCO label. When the Association of American Feed Control Officials approves a dog food they will put a “complete and balanced” label on the packaging. This guarantees that the food contains the minimum amounts of all nutrients your dog needs in order to maintain a healthy diet. Both Taste of the Wild and Blue Buffalo are AAFCO approved. Ingredients. Make sure you are not feeding your dog anything that they may be allergic to. Also, like we try in our own diets, to choose a food which contains lots of meats and vegetables as opposed to one with more corn products. Many grain-free products are now on the market that could be a good option for your dog. Age. Just like you wouldn’t feed a baby the same food you eat, depending on your dog’s age you will feed them a certain kind of food. Pay attention to whether the dog food that you’re looking at is meant for puppy or adult dogs—sometimes there is even an option for senior dogs. Taste. Also, keep your own dog’s tastes in mind…do you think your dog has a preference to dry dog food vs. wet food? Does your dog seem to like beef flavored pet food over chicken flavored food? It may take some trial and error, but it’s worth looking into so your dog can be both happy and healthy. Both Taste of the Wild and Blue Buffalo are healthy choices for your dog but there are a couple elements of each that make them different and unique. There are several qualities that make Taste of the Wild special as a brand of dog food. Most notably and as the name suggests, Taste of the Wild food is meant to imitate what a dog would typically eat if it were in the wild, meaning all the meats are hormone-free and antibiotic-free. The food is also free of any unhealthy preservatives that are present in lots of other dog foods. Every recipe of Taste of the Wild is also grain-free. The family that created Taste of the Wild did so because they noticed a lack of natural, healthy, grain-free dog foods on the market. 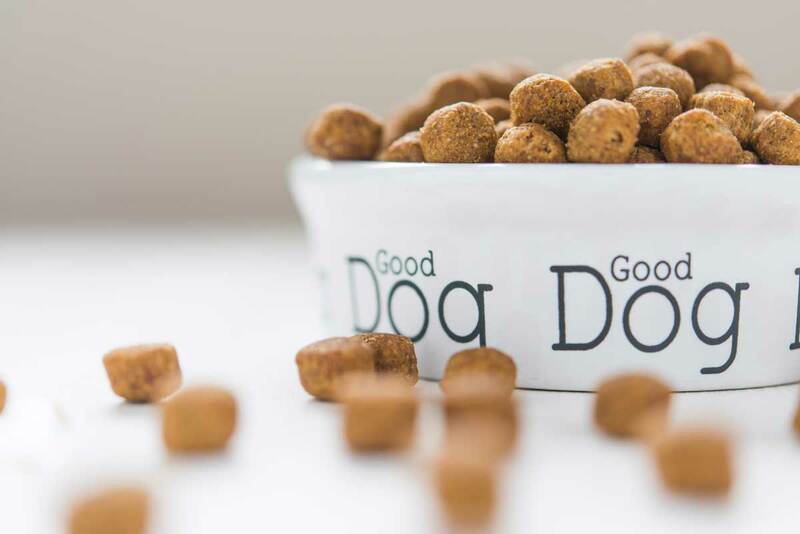 Since the demand for more grain-free dog foods has grown considerably over the last ten years or so, they have been quite successful since their start in 2007. Taste of the Wild has five different formulas for adult dogs, including a wet and dry option for each formula. They have two puppy options. The average price for a 15-pound bag of food is approximately $30. For twelve cans at 13.2 oz each, the price is about $28. Blue Buffalo came to be when a couple was having problems with their Airedale Terrier named Blue. Blue was having some health problems and his owners realized there weren’t that many readily available, nutritious options for dog foods on the market. Blue Buffalo foods always contain either chicken, lamb, or fish, and fresh fruits and vegetables. There are never any artificial flavors, meat by-products, or corn, or preservatives in their food. It also contains what they call “LifeSource Bits” which is a healthy blend of vitamins and antioxidants. What makes Blue Buffalo incredibly unique is the vast amount of options—in total, they offer 19 puppy options, 20 senior options, and over 100 kinds of adult food options. With that many possibilities, it is safe to say that your dog is sure to find a healthy food that it likes from Blue Buffalo. Since there are so many varieties of food, it is harder to determine what a steady going-rate is for their food, but a package of twelve 13.2-ounce cans are approximately $28 and a 24-pound bag runs for approximately $50 depending on the kind of food you get. When you buy Taste of the Wild it guaranteed that your dog is getting a grain-free food. While Blue Buffalo does have a few grain-free options, most are not grain-free. If your dog’s food being grain-free is important to you, keep that in mind. Taste of the Wild and some of Blue Buffalo’s formulas are very competitively priced, except Blue Buffalo’s grain free option—it is much more expensive. If you know you want the grain-free option, it is probably best to stick with Taste of the Wild. Blue Buffalo has a lot more variety and a whole other option for senior dogs that Taste of the Wild does not. If you have an older dog or a dog that’s a pickyeater, this may affect your decision. While both are undoubtedly healthy options, note that with Taste of the Wild there is a guarantee that you are getting food containing hormone-free and antibiotic-free meats. That is not a guarantee with all Blue Buffalo formulas. We hope this article helped you decide whether Taste of the Wild vs. Blue Buffalo is the better option for your dog. Don’t fret over your decision—both Taste of the Wild and Blue Buffalo are healthy options that provide the complete and balanced diet that a healthy dog needs to live a happy life. If you found this article useful on Taste of the Wild vs. Blue Buffalo dog food, share it with your friends on social media. And, don’t forget to subscribe to our newsletter to get the most recent posts and updates from the blog. Thanks for reading!